yes. breakfast is best when it is not sweet and when it is not doused with cinnamon. I completely agree with your last statement! 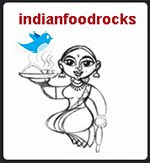 I always prefer a savory b'fast as well :-D. Medha is very innovative! A great foodie in the making :). And the first picture is great! Oh and did i say that pohe and upma make the best b'fasts :). You have such a wonderful blog; I've enjoyed visiting during NaBloWriMo. How do you make blogger behave so wonderfully, and make it do such nice tricks? And those marvelous photos! I can say that too Breakfast is good when its spicy, guess we india's are tuned to spiciness without that it tastes very bland. 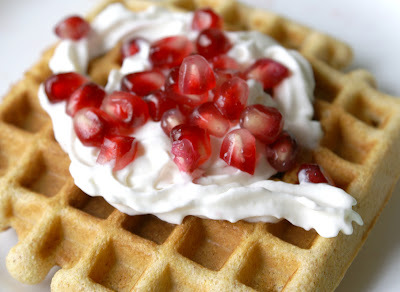 Like the pic of pomogranet in the waffle pockets. Burnol an anti-biotic...who would've thunk? That was much before my label reading days. Agree w/ you: savoury breakfasts are the best...pohe, upma, phodnichi-poli. Bee, Medha might disagree about the cinnamon bit. She has recently discovered the joys of toast, slathered with a goop made of cinnamon powder, sugar and butter. It's her pre-breakfast on weekends. Musical, upma is a hot favorite for breakfast, with afternoon tea and sometimes I throw in a lot of veggies and that's what's for dinner! Hotbutton Press, welcome to IFR! And thank you! I loved your knitting blog. I claim to knit, too - it's just that it takes me years to finish anything! Hmm! I just realized I have fodder for a NaBloWriMo post. You'll see it soon! I am still on the old Blogger templates - once I upgrade to the new layout whenever that is - things should improve quite a bit here. Madhu, thanks! I can't view your Blogger profile so I can't tell if you are the same Madhu I am thinking of. Please make your profile public and if you are on Wordpress, add your wordpress blog's URL to the field 'My Web page'. TC, and like most antiseptic ointments, it's something we don't need especially in the OTC strength. Or at least that is what my sister keeps telling me! Phodnichi poli is shredded poli with phodni? I love that! My breakfast is usually leftovers from the previous night's dinner. There are many people who won't eat last night's dinner for breakfast or will eat only 'breakfast items' for breakfast. I was therefore thrilled to find out that Andrew Weil actually prefers leftovers for breakfast, too. And it makes a lot of sense. 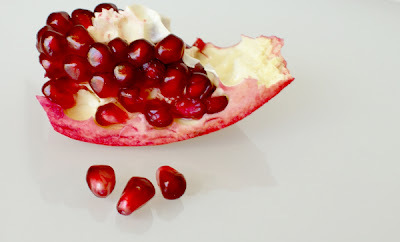 It's usually savory or spicy and not sweet. Which means that you won't be getting hungry in less than an hour once your blood sugar drops. It's quite filling and is usually a more balanced meal that cereal and milk. It also saves a ton of time in the mornings! 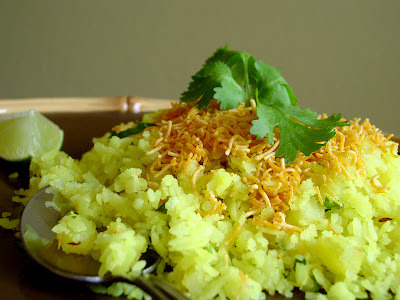 The poha looks really good, I would go for that as I only like sweet breakfasts once in a blue moon. 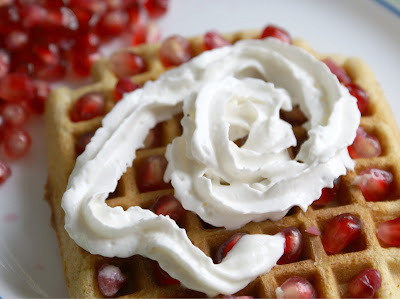 But what Medha did to her waffle was charming...I bet she's tickled that you snapped a photo and posted it! You make your own waffles huh? A rare thing nowadays...makes me think I ought to bring my own iron out into the light. It's been awhile. Hmmm. I've used that mix for pancakes though- yes, good stuff! The pictures are enticing enough that I want to consider a not-so-sweet breakfast, but I will need the back-of-the-pack recipe. And to approximate the multi-grain flour you use, what flour mix do you suggest? Atta mixed with...? thali peeth flour mix :D ? Yes, not only for breakfast,but even for snacks we Indians crave spicy and savoury...a cookie can never be a samosa with chai - the perfect balance of yin and yang! How I used to wish I could pick a savory snack with my coffee from the corner cafe for the mid-morning snack at work in Denver...I would pick focaccia sometimes - not the same. And yes, TLO, you are very nifty with blg-tricks - your is the only Blogger-blog where I don't have to 'view page in new tab' to write a comment! What's with Blogger there? ...the pohe won even though the waffles weren't sweet. There is no sugar in the mix but the recipe called for 1 tbsp of honey. And, yup, I make my own waffles. I don't know which I like more - the POM tea or the POM glasses! Matching coasters? I don't keep the lids! I never thought of using them as coasters! 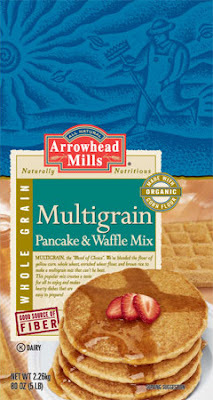 Anita, follow the link to Arrowhead Mills' site to see the different flours in this mix. Corn flour seems to be in a higher proportion. There's wheat, brown rice and rye flours as well as white flour. The recipe called for some oil, honey, an egg and regular or soy milk. Let me look up pancake mixes in The Joy of Cooking for you to see if there is a nice homemade mix you could make. Bagels are 'in', as breakfast food. With light cream cheese. That's what we had for breakfast most of the time when we were on the road this summer. 'View page in new tab'? Most templates have the permalink on the post title or the time of the post (at the end of each post). Many people choose to have comments pop-up in a new window. I prefer to have them show on the same page. But to add a new comment, you have to go to the Blogger page. So I am a little confused by your question! When you click on 'post a comment' only half the comment window opens and you cannot see what you type, or even the full word verification unless you 'open in a new tab', and you cannot pull to make the window bigger! I got around the problem only when I read Kalyn's note somewhere (many months ago) about trying to open the comments in another tab/window to get around this bug...it seemed to have fixed itself but lately it's back bugging us. Upma with lots of vegetables is an all time food, na! i will add paranthas, rave idlis and sajjige/sooji rotti to that list too :-D.
Lemme brag a lil' ;). For evening snacks with coffee, there's now a Falafel shop around, walking distance from the local Starbucks, so i do get to have some chai-pakoda kinda' luxury once in a while :-D.
And i am really hungry now! There is no sugar in the mix but the recipe called for 1 tbsp of honey.